The Salvation Army has changed lives and given hope to countless people throughout the nation. But we never do it alone. There are few things more rewarding than giving one's time to help someone else. 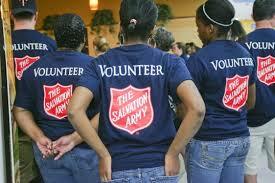 The Salvation Army relies heavily on volunteers for all our programs- the army behind "The Army". Our many volunteers play a crucial role, strengthening and extending services throughout the community. We need you -- your skills & experience. Dedicated to finding a good match between a volunteer's desire to serve and our opportunities for service, we want to be good stewards of your time, talents and resources, giving you the highest satisfaction possible when serving. Check out our opportunities below to see how you can fit in our picture! Work with elementary-aged children in an after school setting to help with literacy, math, STEM, and other elements. A community meal is served in the shelter every night at 5 pm. If you'd like to participate, click the link. Max of 4 people serving per night. Build camaraderie by giving back. Projects include painting, organizing toys, running Bingo Night at the shelter, and more. Email Deb for details. We never know when disaster will strike, but we're prepared. Activities include canteen operators, clean-up kit facilitators, food preparers, and more. Didn't find what you're looking for? Create your own volunteer experience! If you or your group has special skills or interests, we will work with you to custom design a volunteer activity. Contact Deb for further details.